So I went there. I actually added chocolate to a samosa and here I am introducing you to the Chocolate Samosa. I think this proves the level of my addiction to chocolate. For those of you who are familiar with the samosa, will know that it’s a popular savory South Asian snack. It’s basically a triangular shaped thin crisp pastry filled with savory fillings ranging from spicy mashed potatoes to chicken to minced meat, etc. So the recipe is extremely easy, because you’re essentially just folding pieces of chocolate into pastry; but the actual folding of the pastry may seem complicated at first. However, there’s no need to fret because I’ve made a video for the Chocolate Samosa (see above), so that you can see for yourself how easy the folding of the pastry actually is! I would highly suggest watching the video before making this recipe, because it’s important to understand how to fold the pastry correctly, or else the chocolate will leak out during baking, and that would be a pity. 3.) Samosa pastry is usually widely available in the frozen section of large grocery stores, but if you can’t find it, try at a nearby Asian or Indian store near you. 4.) You’ll also be making a flour paste which will work as the ‘glue’ to seal the chocolate samosa. This is a simple mix of all purpose flour and water. One other tip I’d like to give you is to separate the number of sheets you need beforehand (the recipe calls for 12 sheets for 12 chocolate samosas) and have your flour paste ready. It sort of gets hard to separate the pastry sheets while you have the flour paste on your finger. The process is simpler and quicker if you have all your things ready for the assembling of the samosa. 5.) You can use any kind of chocolate you like. Dark, milk, nutty, anything you like! I would just suggest not overfilling the samosa pastry with chocolate because it won’t seal properly and too much chocolate may rip through the samosa pastry. 6.) These Chocolate Samosas are served best straight out of the oven. 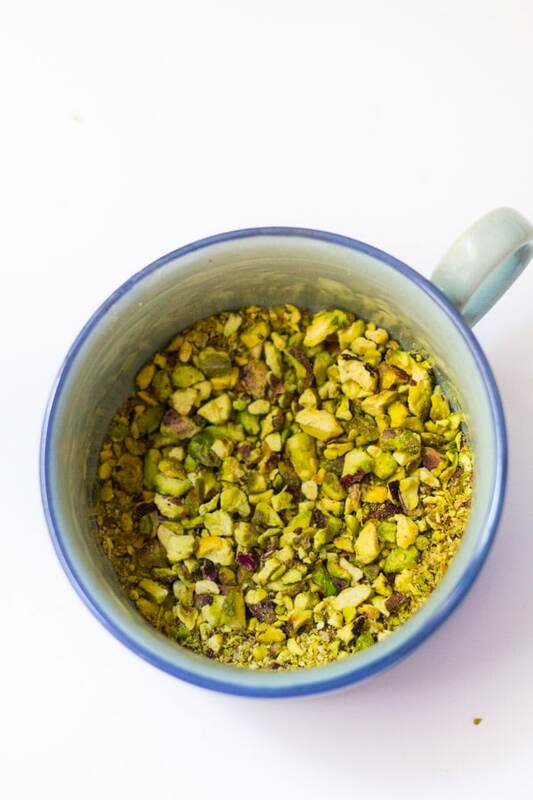 I like to drizzle them a bit with chocolate ganache (never say no to more chocolate) and crushed pistachios. 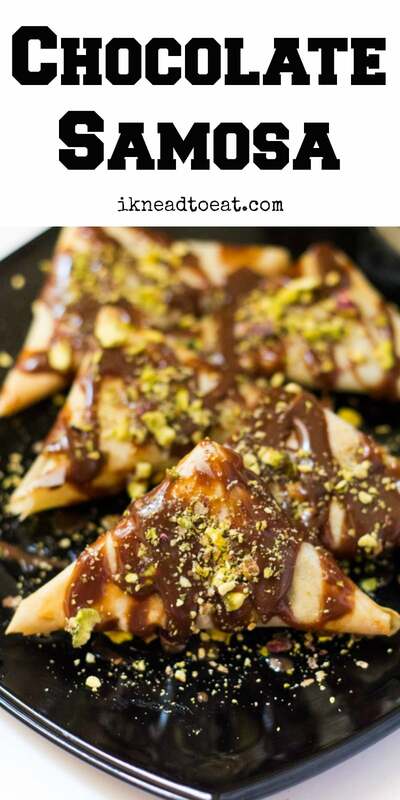 Phew, that was long post explaining how to make the perfect Chocolate Samosa! That just shows how passionate I am about all things chocolate, no? Or maybe a tad too obsessed? Lol. 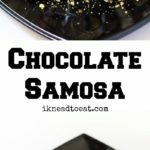 A step by step guide to making the perfect Chocolate Samosa, a delicious crispy chocolate snack. Video included to explain the folding process of the samosa. Preheat oven to 180 C and prepare a baking sheet by greasing it lightly. Mix together the flour and water to form a thick paste. This flour paste will act as a 'glue' to seal the chocolate samosas. Take one sheet of samosa pastry and place a piece of chocolate, and following the steps in the video, fold the samosa pastry into a triangular shape. Seal the samosa pastry by spreading the flour paste on the last flap and fold it over to seal the samosa completely. The folding steps are easier to follow in the video, so please watch that before making the samosas. Place the prepared samosas on the baking sheet and bake for about 10-15 minutes until the samosas are light golden brown. While samosas are baking quickly prepare the chocolate ganache. 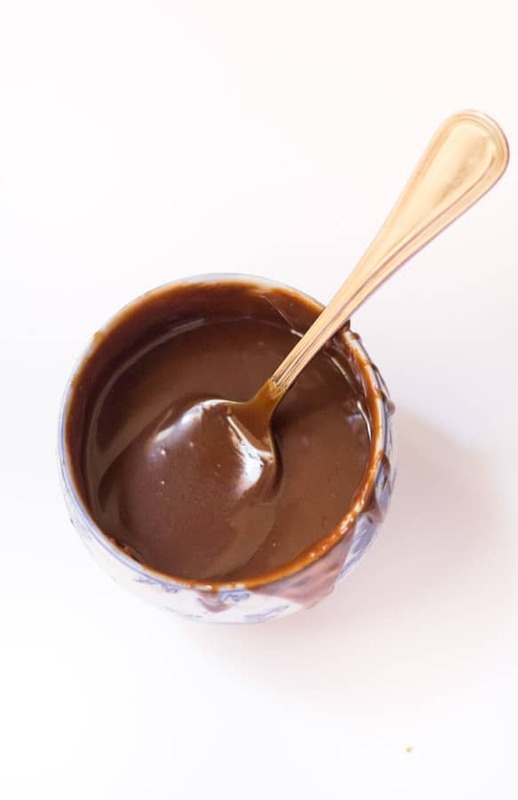 Place the chocolate and heavy cream in a microwave safe bowl and heat for about 1 minute, stopping the microwave every 15 seconds to stir so that the chocolate doesn't burn. 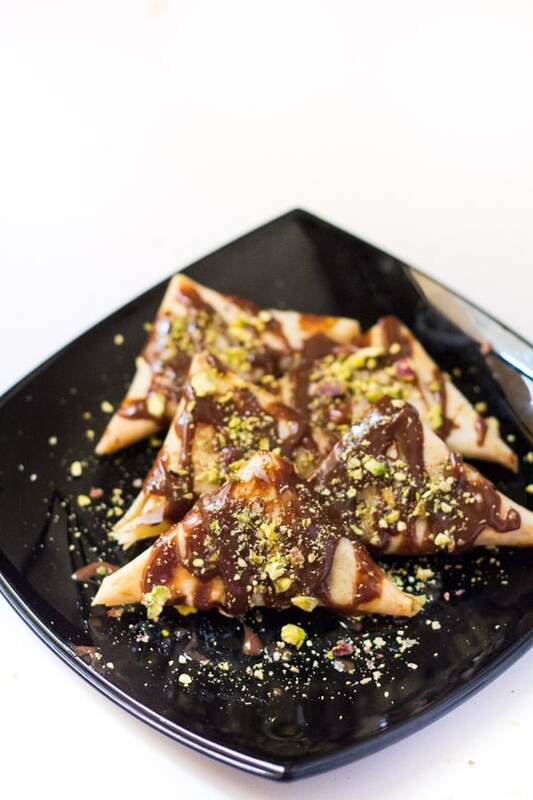 Remove the samosas from the oven, drizzle with the chocolate ganache and sprinkle with crushed pistachios. Serve immediately. These chocolate samosas are best eaten right after being baked.